Don’t come in, Dad, I’ll be out in a minute! It’s time for some filler! Godzilla gets arty for a bit as we buy some time before the next bigger battle issue. 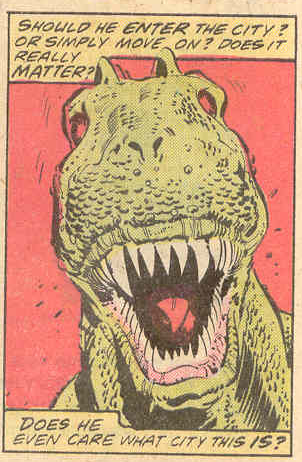 If you need some catching up on what the heck is going on (it has been a bit since I posted one of these) drop on by the Godzilla Marvel Splash Page, and be sure to check out all the goings on for March of Godzilla 2013! 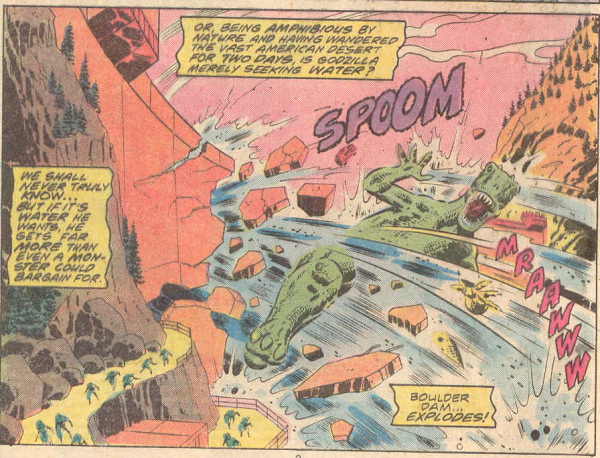 Godzilla smashes Boulder Dam (aka Hoover Dam) because he feels like smashing something. The torrent of water washes him away. Godzilla lands next to Vegas, and debates whether to go do a Hangover prequel or just hang in the desert. 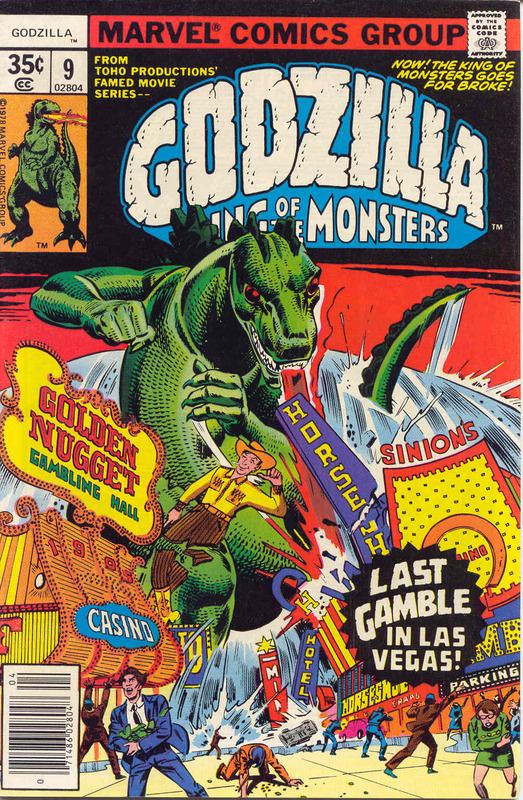 Of course Godzilla goes and starts destroying casinos, because gambling is a sin and Godzilla is all about the Jesus. And the comic would be boring if Godzilla just sat in the desert and meditated. Luckily the Vegas cops are on the scene, all Las Vegas cops wear military style blue uniforms with red visoered helmets and red gloves and carry assault weapons. It was in a comic book! At Hoover Dam, the rest of the dam gives way and another flood heads towards Vegas. It causes more dmages than Godzilla, and even pushes Big G around. Godzilla decices to go wander in the desert. Dum Dum pursues Godzilla in the Behemoth, while Robert has finally been coaxed out of the Red Ronin and grounded. For life! Not really. Only most of his life. There is also a simultaneous story of a gambling addict during the whole story that sort of paralleled, but not entirely. I sort of like these stories that are basically filler. 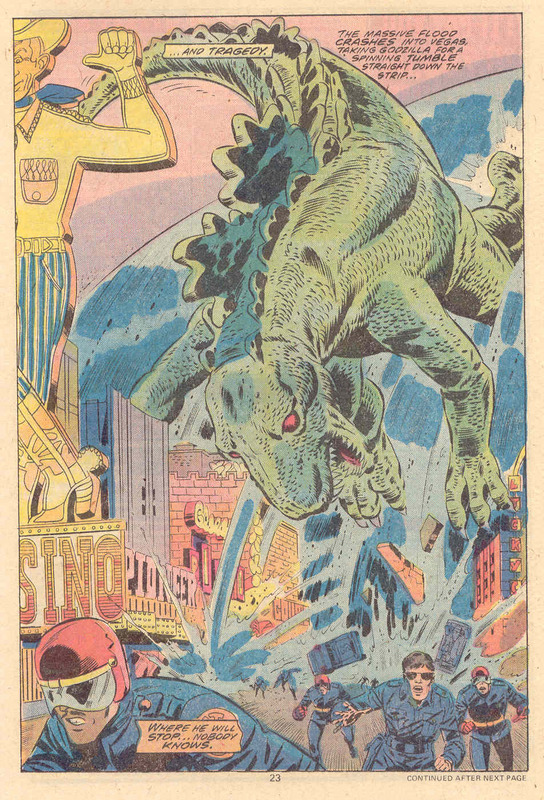 Godzilla shows up and attacks Vegas because he has to make a stop by at some point to trash landmarks. But like Vegas, once the fun has been done, the city is then really boring and it’s time to go wander in the desert, as that is more exciting than Vegas. Is there a reason the Las Vegas police look like Space Rangers? My first lettering assignment. The first of 1,100. It was all downhill from there.